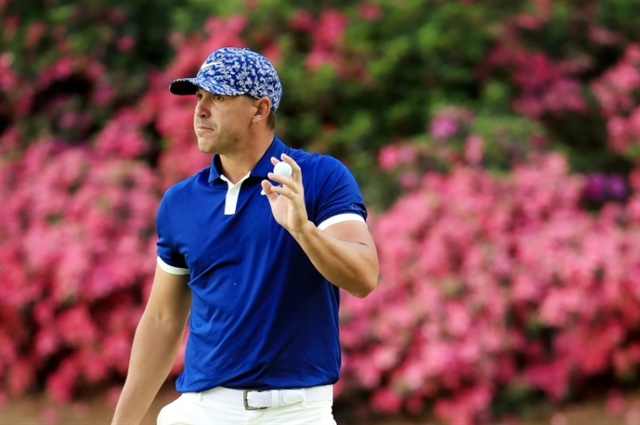 AUGUSTA Brooks Koepka and Bryson DeChambeau burst out of the crowd Thursday at Augusta National, firing six-under par 66s to share a one-shot lead over Phil Mickelson after the first round of the Masters. Hours after 14-time major champion Tiger Woods electrified fans by briefly putting his name atop the leaderboard, Koepka lit up the fabled course with five birdies in the space of six holes to break free atop a crowded leaderboard that at one point saw nine players sharing the lead. But DeChambeau had an answer, roaring home with four straight birdies -- and six birdies in his last seven holes. Mickelson, the three-time Masters winner who at 48 could become the oldest major winner ever, kept pace with the 20-something leaders with five birdies in the last seven holes in his five-under 67. That matched his opening round in 2010 -- the year Mickelson claimed his third green jacket. He nearly aced the par-three 16th and a birdie at 18 put Mickelson one shot in front of 43-year-old Ian Poulter and 34-year-old Dustin Johnson, who shared fourth place on 68. Former champion Adam Scott of Australia, Spain's Jon Rahm, Thailand's Kiradech Aphibarnrat, South African Justin Harding and American Kevin Kiser were a shot back on three-under 69, with Woods heading a big group on 70. Red-hot Rory McIlroy, seeking a breakthrough Masters that would make him just the sixth player to complete a career Grand Slam, was left regretting six bogeys in a one-over par 73. But as he departed the course, the Northern Ireland star expressed surprise that no one was taking advantage of the rain-softened layout. Koepka, winner of a second straight US Open title last year along with the PGA Championship, didn't put a foot wrong. Koepka rolled in a five-footer at the 10th and after a par at 11, he drained a putt from off the green at 12, rolled in a four-footer at 13 and curled in a 16-footer at 14. He hit his third shot to two feet for a birdie at 15 as he stretched his lead to as many as two strokes. "I don't want to say you kind of black out, but you're not really thinking about anything," he said of his hot stretch. "You make it kind of a reaction sport. You kind of see your shot, and then whatever you see just pull the trigger and go.